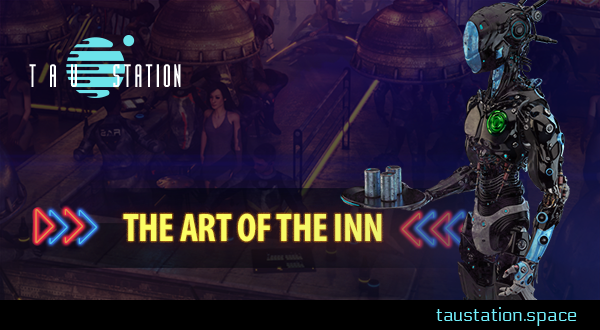 The Inn is the heart of a station for frequent travelers, adventures, and local residents. No two are alike. One may be entirely nautical themed, such as The Mermaid on København, while another boasts the most delicious noodles in the galaxy. There are Inns where you can dance the hours away under sparkling lights to a galaxy-famous DJ, or sip freshly brewed coffee in a small cafe, or just tuck yourself away in a cozy booth, chatting with friends by lamplight. The Inn gives access to three other station areas: the Guest Rooms, the Bar, and the Lounge. 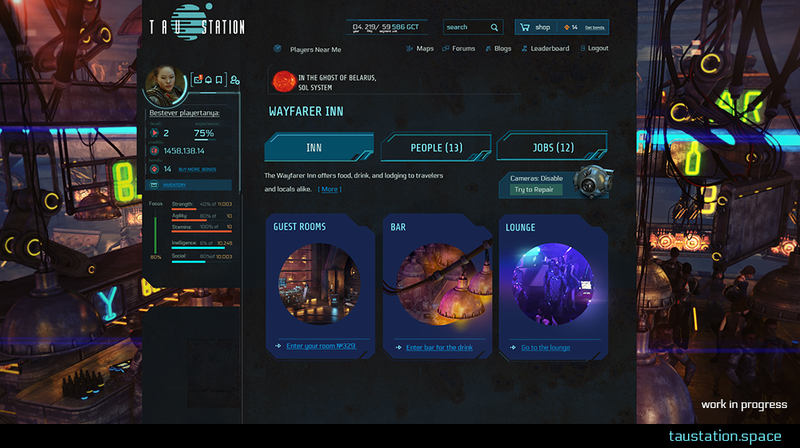 You can also speak with people sojourning in the Inn, or use your profession to perform jobs in this area. 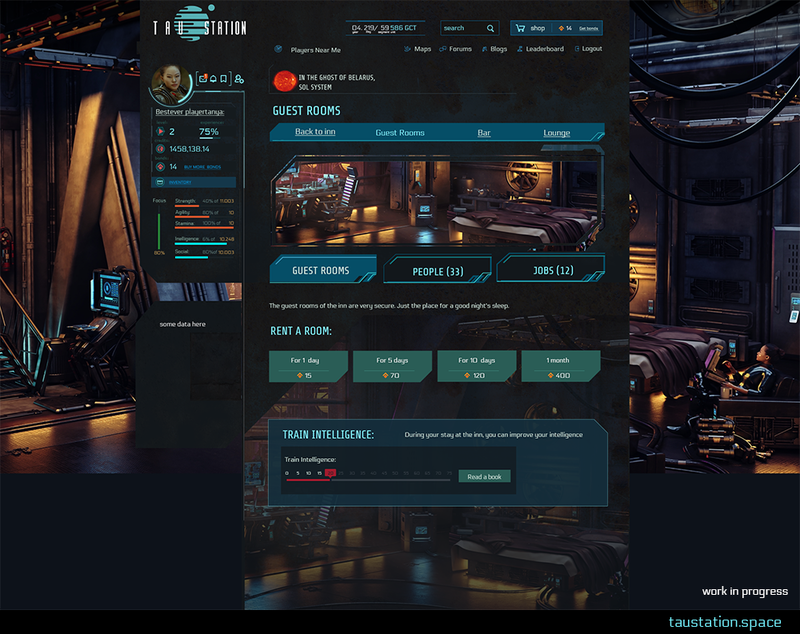 Life post-Catastrophe can be dangerous, and even though security on many stations works to be diligent, there still are pickpockets and thieves who won’t think twice about gunning for your credits and property. The Guest Rooms are private chambers in which to rest and relax, tucked away safely and soundly behind locked doors. You can rent a room for one day or up to a month. Get a price reduction by staying longer! Use the down time to train your Intelligence in peace and quiet. This Guest Room is comfortable and more spacious than most, with a very high ceiling, a large window protected by metal struts, a work desk, several computer terminals and comfortable chairs. 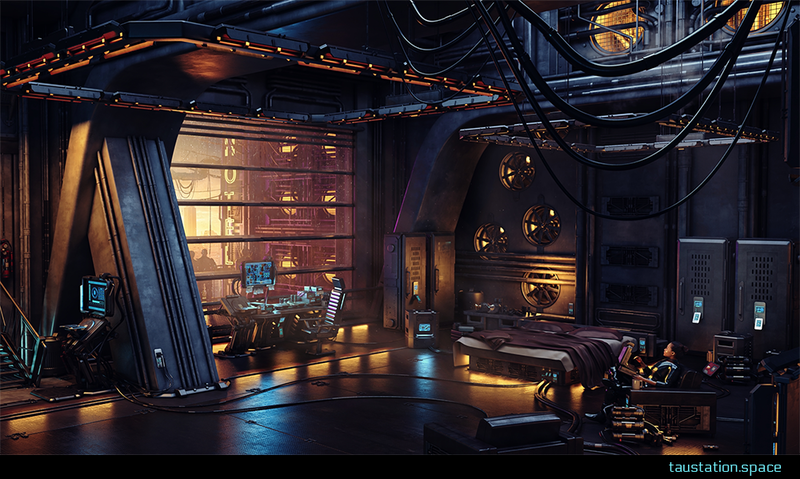 The walls and the floor of the suite are made of metal, and loops of wire give the room the feeling of a factory workshop. Two large rectangular structures hang from the ceiling; track lighting whose warm light help to create a cozy atmosphere. The bed is large, and rumpled with use, its pillows tossed haphazardly. Large fans circulate recycled air while station residents go about their business outside the huge wall-to-ceiling window. 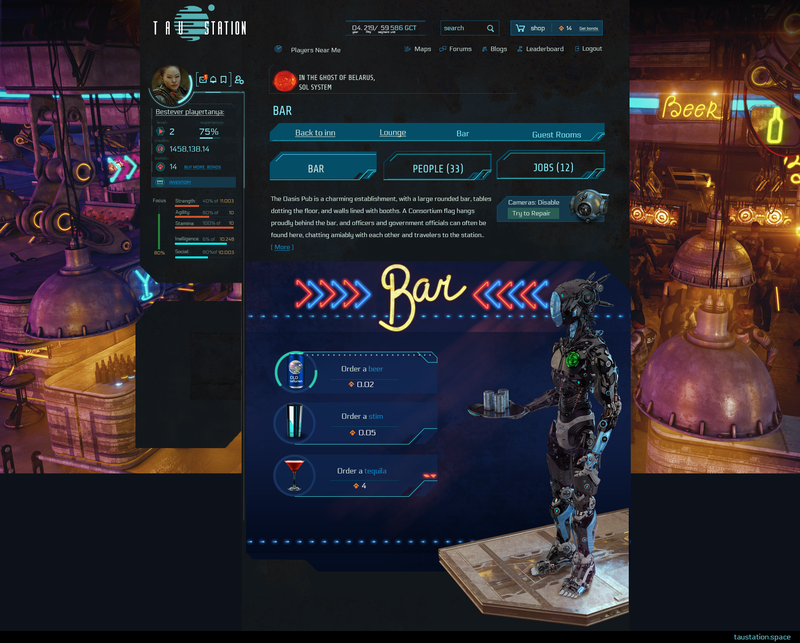 At the Bar, you can toss back a frothy beer, sip on a martini delivered to you by a serving bot, or replenish your stim supply. Just be careful how much you drink, you don’t want to end up in the brig or in a bar fight! Patrons of this large bar look down upon the establishment from a second floor, leaning against a railing that allows them to view the dance floor and bar area. Neon signs advertise the various drinks available, shining loops of light that spell out the word “Beer,” or form the shape of a martini glass. People stand around long islands and bars made of burnished copper-colored metal. 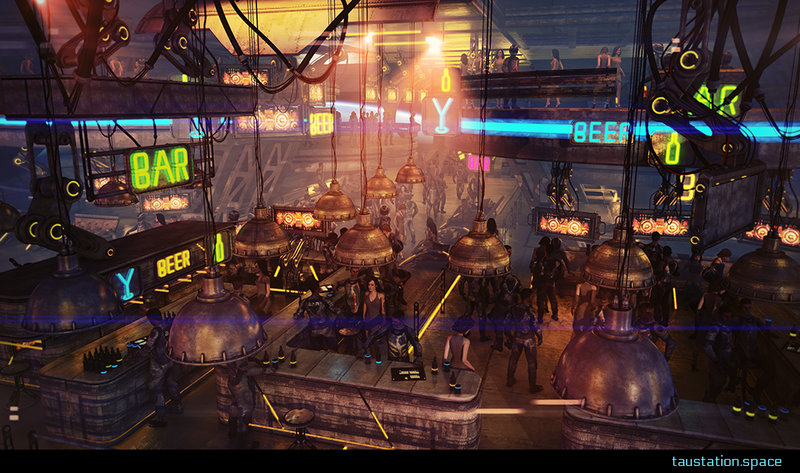 The bars and islands are spread about the room, their tops full of tall bottles wrapped with neon colored strips. Whether moving to the beat on the spacious dance floor, catching up with friends over a cold bottle of beer, or meeting someone new, bars provide a place where station residents and guests can gather, unwind, and let the day’s stresses go. The Lounge is the place to go when you’re looking for stimulating conversation and discourse. Here, you can boost your Social skill by engaging with others. Take heed that you choose your words carefully, though – being rude or saying the wrong thing could get you into an altercation, which can send you to the Sick Bay! Inns are places of comfort, excitement, socialization, culinary treats, and entertainment. Who knows what might happen if you chat up that morose-looking stranger at the bar, or what friends you might make while playing cards crowded around a flickering holo-table. The Inn is where you can refresh body and soul at the end of a long day or arduous journey, enjoy a meal that doesn’t come out of a package, enhance your abilities, or lend an ear to a person in need. And who knows? That person might just start you on a new journey and adventure.